Dr. Sullivan-Bol is a Board Certified Chiropractic Physician. He specializes in the evaluation and treatment of musculoskeletal, orthopedic, and neurological pain and injury, and welcomes you to experience health care in a comfortable, educational, and healing environment..
Dr. Sullivan-Bol was born and raised in the Southwest suburbs of Chicago. Growing up he competed in gymnastics, martial arts, swimming and diving. He then coached gymnastics and Tae Kwon Do while beginning his undergraduate studies in paramedicine. As a health care provider since he was 18 years old, Dr. Sullivan-Bol was always passionate about medicine. The “road to wellness” took him from paramedics out of the hospital, to mission work in Africa, to emergency medicine in the hospital, to organ procurement and transplantation — he was a transplant coordinator for the Regional Organ Bank of Illinois. After a very unfortunate car accident that severely injured his mother, Dr. Sullivan-Bol watched his mom heal through chiropractic care in just six weeks. Learning how well-rounded chiropractic care is, he decided to choose chiropractic medicine as his career path. While working for the Regional Organ Bank of Illinois, he began his studies at the National University of Health Sciences. There he earned a Bachelor of Science in Human Biology, and later, a Doctorate in Chiropractic Medicine. Through Metagenics, Dr. Sullivan-Bol is a certified Lifestyle Medicine Provider through First Life Therapy. As a medicine provider, he helps to take people on a thorough healing journey through lifestyle medicine. As a dedicated husband and father of two, Dr. Sullivan-Bol enjoys spending time with his family when he is not working. He enjoys the winters in Vermont, embracing outdoor sports whenever possible. Whether it is the local triathlete group, running groups or cycling groups, Dr. Sullivan-Bol enjoys supporting the community. He’s a sponsor of Girls On The Run and the Training For More training group. 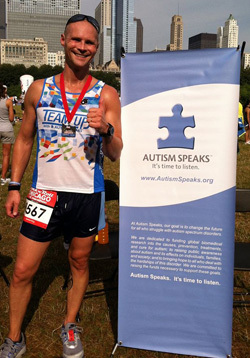 As a distance runner for Autism Speaks, Dr. Sullivan-Bol represents autism awareness by wearing his Team Up for Autism gear whenever possible.